Henckel Knives are a very well known knive manufacture. For over 275 years henckel has brought it self up to be one of the finest cutlery knives money can buy. Most of their new models are superior in sharpens. Henckel set out to shows this with their new optical illusion advertisement. 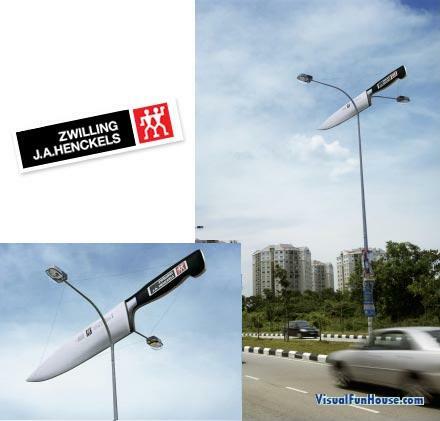 Henckel knives are so sharp they can even split this street light.. now that’s sharp! I have personally used them and they are a fine product and thanks to their marketing team created a great illusion to show them off. Actually, Timothy, that’s not Photoshopped. Look closely. The knife is attached to the lights by strings. That knife is really there (it’s an advertisement showing how sharp their knife is).